Heat gas or charcoal grill. In small bowl, combine chili sauce, honey and garlic powder; mix well. 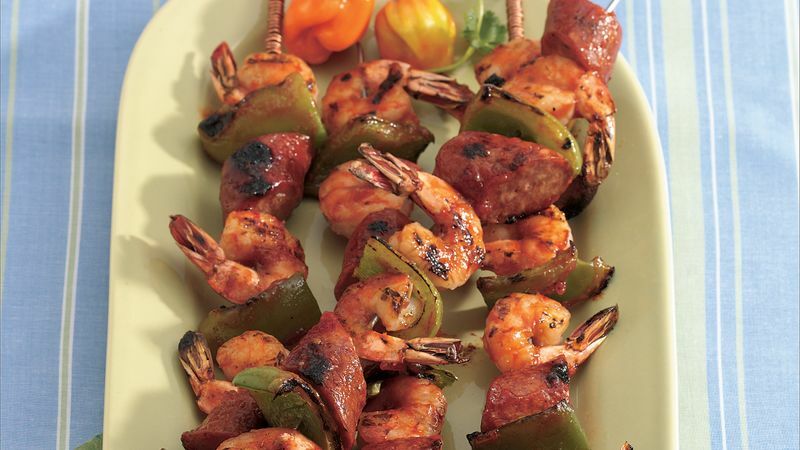 Alternately thread sausage, shrimp and bell pepper onto four 12 to 14-inch metal skewers. Brush kabobs with some of chili sauce mixture; reserve remaining sauce mixture. When grill is heated, place kabobs on gas grill over medium heat or on charcoal grill 4 to 6 inches from medium coals. Cook 8 to 10 minutes or until shrimp turn pink, turning kabobs and brushing frequently with reserved sauce mixture. Bring any remaining chili sauce mixture to a boil. Serve warm mixture with kabobs. When you make kabobs, be sure that the pieces on the skewers are of uniform size so that they cook evenly. To broil kabobs, place on broiler pan; broil 4 to 6 inches from heat using times above as a guide, turning kabobs and brushing frequently with reserved sauce mixture.